Open to all members of the Reed community. Auditions Thursday, August 30, 7:40 - 9:00 p.m., and Tuesday, September 4, 7:40 - 9:00 p.m. if necessary. For information, contact David Schiff at dschiff@reed.edu. Open to all members of the Reed community, regardless of experience level. 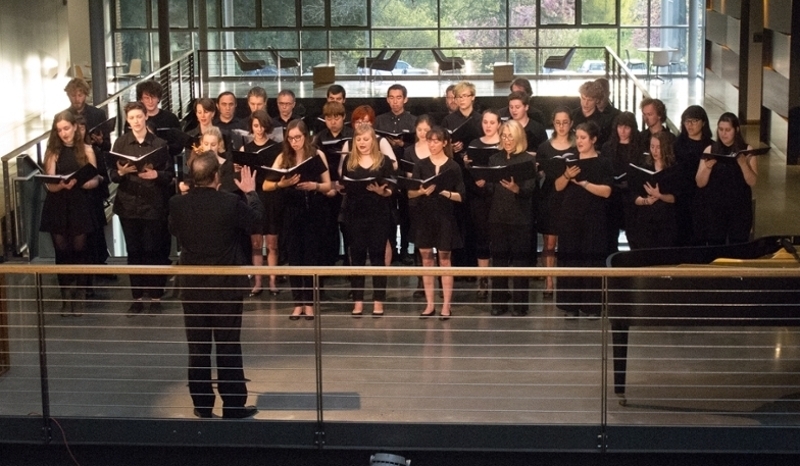 The Collegium is a select ensemble of 16-20 singers. The ability to read music and prior ensemble experience are expected. Contact John Savage john@johncsavage.com or Denise VanLeuven dvanleuv@reed.edu with questions. First meeting Monday, August 27, 2018, 4:10 p.m., PAB 320. Come with your instrument and be ready to play. Auditions are informal. Rehearsal times are arranged according to the availability of players. Please contact Denise VanLeuven (dvanleuv@reed.edu, ext 7472, PAB 102). Can I register for lessons or an ensemble if I'm also registered for 4.5 credits? If you wish to avoid an overload, lessons can be taken for 0 credit. More information regarding academic credit. How do I get access to locked practice rooms? If you are studying piano or percussion you may obtain card swipe access to the locked practice rooms. Please contact Denise VanLeuven (dvanleuv@reed.edu, PAB 147, ext. 7472) for more information. When are the practice rooms open? The practice suite is open from 8 a.m. – 11 p.m. for the Reed Community. All students enrolled in a MUS class have access to the practice suite 24 hours a day. Does the music department have instruments to loan? Yes, we have a variety of instruments that can be loaned to students who are in the orchestra or who are taking lessons. Please contact Denise VanLeuven for more information. Where can I store my instrument? Lockers are located on the 3rd floor of the PAB. Large instruments and amplifiers can be stored in large storage rooms. Contact Denise VanLeuven for lockers or keys to storage rooms.